Hitting the road and looking for a romantic dining spot? 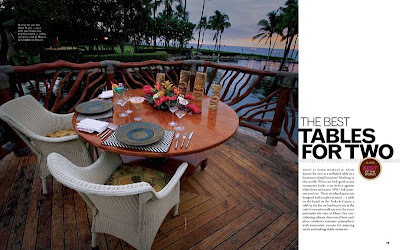 Check out the Jan/Feb 2009 issue of ISLANDS Magazine which includes The Best Tables for Two. My shot (& story) from Humuhumunukunukuapua'a (betcha can't say that 5 times fast!) at Maui's Grand Wailea is included in the mix.